After seven years of service as the president of Tulane University, Scott Cowen watched the devastation of his beloved New Orleans at the hands of Hurricane Katrina. When federal, state, and city officials couldn't find their way to decisive action, Cowen, known for his gutsy leadership, quickly partnered with a coalition of civic, business, and nonprofit leaders looking to work around the old institutions to revitalize and transform New Orleans. This team led the charge to restore equilibrium and eventually to rebuild. For the past nine years, Cowen has continued this work, helping to bring the city of New Orleans back from the brink. 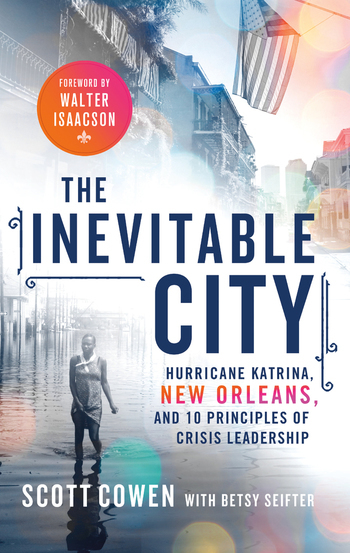 The Inevitable City presents 10 principles that changed the game for this city, and, if adopted, can alter the curve for any business, endeavor, community—and perhaps even a nation.This is the story of the resurgence and reinvention of one of America's greatest cities. Ordinary citizens, empowered to actively rescue their own city after politicians and government officials failed them, have succeeded in rebuilding their world. Cowen was at the leading edge of those who articulated, shaped, and implemented a vision of transformative change that has yielded surprising social progress and economic growth: a drowned city identified with the shocking images of devastation and breakdown has transformed itself into a mecca of growth, opportunity, and hope. Scott Cowen is president of Tulane University and was one of the key players in the rebuilding of New Orleans after Hurricane Katrina. His work has been widely covered by the media, including Fast Company Magazine, Newark-based The Star-Ledger, The New York Times, and The Chronicle of Higher Education. He is also a guest panelist on the Sirius talk show "Doctor Radio." TIME magazine has named President Cowen one of the nation's Top 10 Best College Presidents and New Orleans CityBusiness called him one of the 30 "Driving Forces" in New Orleans in the last 30 years.